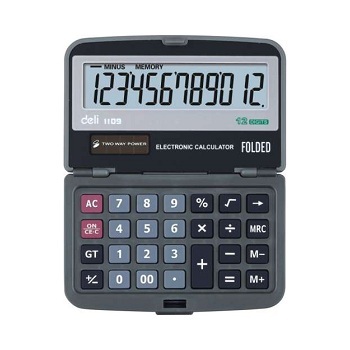 Deli...cious value Pocket size, hard case, folding calculator. 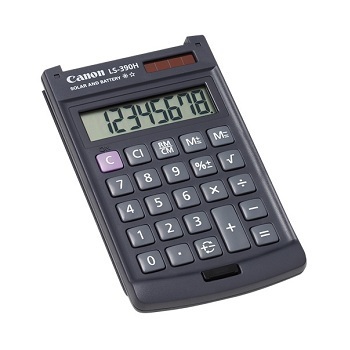 12-digit large display with easy to read and operate keyboard. Auto power off, Memory function, Profit and GT summation keys. Dual powered - solar and battery. 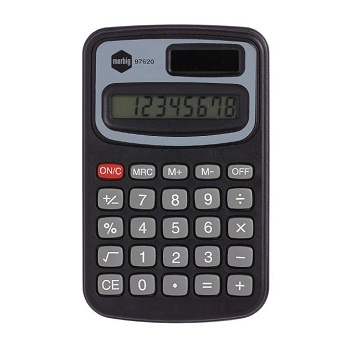 8-digit pocket size calculator ideal for home, office and school use. Flat display. Large display and large keys. Percent key and Auto power off. Memory, square root and change sign functions. 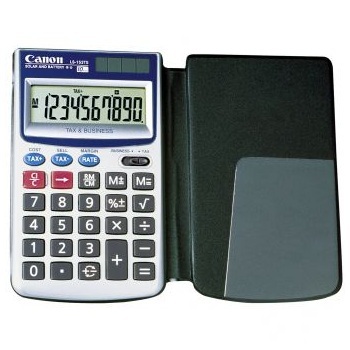 Compact pocket calculator, extra large 8-digit display for easy viewing. Extra slim and lightweight design fits neatly into your hand for comfortable use. 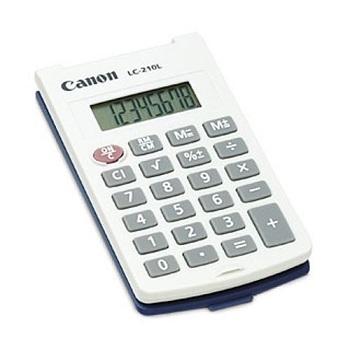 Features include 3 key full memory function, percentage and square root keys. 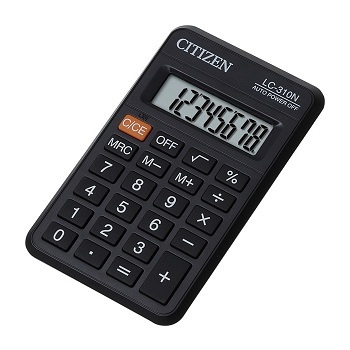 8-digit extra large LCD display pocket calculator. Unique 360° upward folding protective hard case. Modern colour and design with two-tone finish. Memory,Percentage and Automatic Constant functions. Auto power off. Battery powered (up to 5,000 hours of use with 1 x LR-1130). 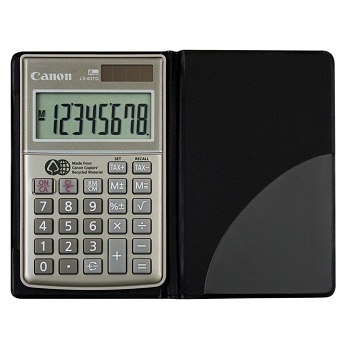 Pocket Tax Calculator with 10-digit large LCD display and protective wallet case. Stylish slimline design with a metallic finish.Non-slip rubber keytops. 8-digit extra large LCD display with unique 360° upward folding protective hard case. Large keytop characters and large plastic keys. Sign change key - allows for easy calculation of negative numbers. Percentage, Memory, Square Root and Automatic Constant functions. 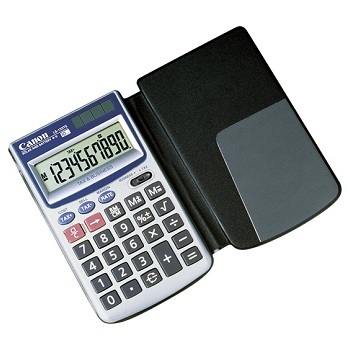 The LS-63TG is an environmentally friendly "Green" calculator. Lead free product. The upper and lower case is made from 100% recycled plastics from Canon copiers. 8-digit big number display for easy reading of the screen. Tax/GST function. 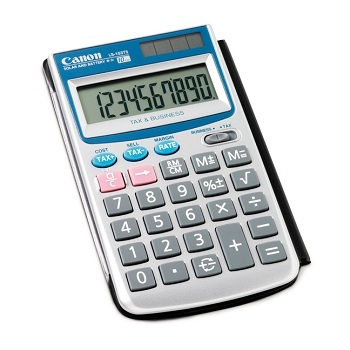 Percentage, Memory, Square Root and Automatic Constant Functions.